Try this budget-friendly, lightened-up menu of BBQ classics, so you can still enjoy burgers, pasta salads, and dessert without doing any damage to your waistline—or your wallet. There’s no better way to soak in long summer nights than barbecuing with friends. I’ve created a budget-friendly, lightened-up menu of BBQ classics, so you can still enjoy burgers, pasta salads, and dessert without doing any damage to your waistline—or your wallet. So jot down this grocery list, invite over a few friends, and fire up the grill! A great way to lighten up your average burger! I love the extra kick from the jalapeno. Combine the ground turkey, beaten egg, seasonings, and jalapeno together in a large bowl and mix well. 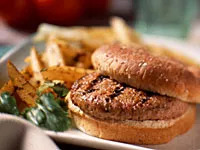 Divide meat into four patties, each about the size of your palm (4 ounces). Grill each burger for about 5 minutes per side, or until cooked through. Top burger with cheese for the last 2 minutes of grilling time. Serve on a bun layered with veggies, mustard, and ketchup. Ditch the heavy mayo dressing and instead serve your family this Greek-inspired salad. It's full of fiber and healthy fats. In a small bowl, combine olive oil and vinegar and whisk well. 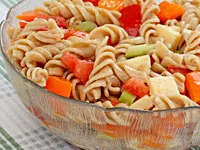 In another larger bowl, combine cooked pasta, chopped egg, bell pepper, celery, radishes, olives, and feta cheese. Drizzle with dressing and toss well. Season with salt and pepper. This salad is best made ahead of time so the flavors can mingle. I recommend preparing it at least 4 hours before serving, or better yet—overnight. The perfect ending to a lightened-up family dinner. 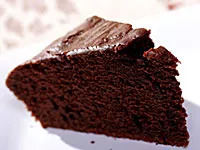 This cake is my absolute favorite dessert and is incredibly simple to prepare. Preheat oven to 350°. Spray two 8-inch cake rounds with nonstick spray and set aside. In a small bowl combine soy milk, vanilla extract, and apple cider vinegar, and set aside for 5 minutes to let curdle. Add sugar and oil and mix well. In another bowl, sift together flour, salt, baking powder, baking soda, and cocoa powder. Add the wet ingredients to the dry ones and fold in the chocolate chips. Pour batter into prepared pans and bake for about 20 minutes, or until a toothpick inserted into the cakes comes out clean. Once cool, smother with your favorite vegan frosting and consume.